Without being affected by its Thai sounding name, nasi pattaya is originated from Malaysia. Nasi Pattaya is a simple fried rice shaped like a pouch which is available at malay restaurants or hawker stalls in Singapore. 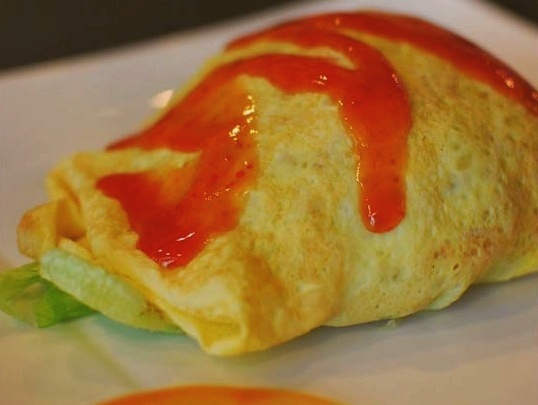 Nasi Pattaya is often served with with sliced cucumber, tomato and drizzled with ketchup or chilli sauce. For the pattaya fried rice: Saute sliced shallots and garlic with a little bit of oil until light brown fragrant. Add the chicken and carrots and stir-fry until cooked. Add the cooked rice and peas – mix well. Season with soy sauce, ketchup and salt and pepper according to taste. Stir the rice is evenly until completely mixed and heated through. Set aside. For the omelette: Lightly beat the eggs and season with a pinch of salt. Heat the pan, brush evenly a little oil over (medium heat). Pour in eggs and swirl the pan by the handle to make a thin omelette. Let the omelette cook and brown at the bottom. When the omelette is done, place the fried rice in the center of the omelette and spread it accordingly. Fold the edges into an envelope shape, making sure to overlap the parcel a bit. Carefully flip the omelette onto a serving plate. Drizzle ketchup or chili sauce over the top. Enjoy! Awesome nasi goreng recipe! Thanks a lot!